Star Story: The Horizon Escape offers cozy exploration and a quirky take on choices-matter adventure. The more RPGs (role-playing games) you've played, the more you'll appreciate Star Story, but it's accessible and enjoyable even to newcomers. I'm hard-pressed to pin the title to one genre, but it draws from survival-crafting and adventure-RPG; I'll settle for simply saying it's fun. You're some guy on a space odyssey, you get stuck on a planet, you chase an escape route, and you make a nuisance of yourself along the way. Star Story is absolutely endearing and regularly pokes fun at its inspirations. Despite your character's avowed goal to escape the planet, every moment you spend traveling across the planet Horizon charms you and begs you to stay longer. When I finished my first playthrough, I felt as though I'd only experienced part of a bigger story, and thankfully, I'm supposed to feel that way. 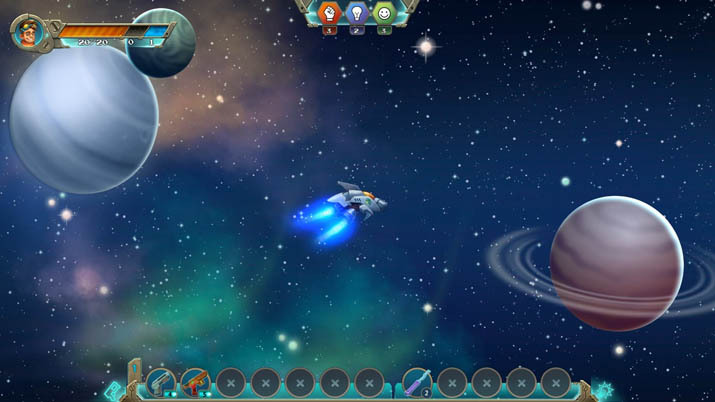 Star Story is a title coming soon to Early Access on Steam, and while the developers class its progress as “81/100”, “expand the storyline” is part of their remaining 19 percent. You start off in a spaceship, cruising past planets, angling toward your goal: Horizon. You pause periodically, and can examine uninhabited rocks and gas giants, much as you examine objects you encounter on your foot journey later on. You make decisions here, too, that lead to butterfly effects throughout the rest of your run. For example, you might destroy the equipment that you can't carry with you once you land (so no one can use it against you), or you might leave it intact and advertise its location to locals in the hopes that they'll use it for glorious scientific progress. Star Story uses a three-pronged alignment system that scores your character's propensity and aptitude for making discoveries, cultivating alliances, and eliminating obstacles. These totals serve not simply as measuring sticks, but rather resources that determine which items you can make in your workshop. Some items enable new dialogue choices during events, so in an indirect way, how your character acts generally affect how conversations turn out in the future. You can save useful loot that you can't make yourself for important choices. As a smarty scientist character, you might be rolling in Universal Translators and using them to avoid combat every chance you get because they're easy for you to craft. On the other hand, your brawler needs to spend those kinds of items carefully, and instead, hand out the grenades, which he crafts like candy, to uncooperative natives. Alignment scores don't bar you from any decisions or opportunities in Star Story, but they do dictate the type of problem solver you become, and they unlock ways for you to better do so. Your friend-to-all character can absolutely use those high-tech anti-gravity jump boots to kick a bad guy in the face, but that means you can't use them later to impress a pretty girl. Then again, if you're paying attention to that girl's personality and picking dialogue options that don't tick her off, you might not need to use any items to earn her respect. 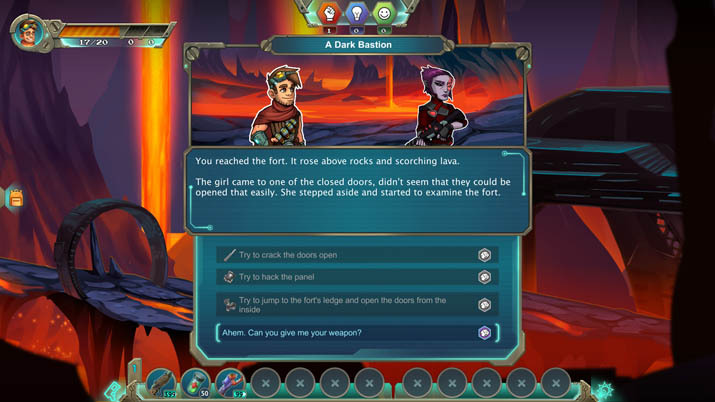 Along with the survival RPG elements, Star Story also includes a puzzle mechanic. You’re offered a series of choices, and you figure out which one is right from what you've read so far about the situation. You might be asked to disarm a trap in three steps. Will you shoot it, or shine a laser in its direction? Throw a smoke bomb to obscure its motion sensor, or snag a key component with your grappling hook? You get a limited number of attempts to solve these innovative multi-step puzzles. You can use items to save yourself after failure or to bypass puzzles, but I usually made more friends and found more loot by using my head in these situations. The interface is smooth — definitely smoother than the use-this-on-that formula that too often frustrates us and makes guides mandatory. I hope to see other titles adopt Star Story's approach, and for EvilCoGames to refine this mechanic further yet. The worst I can say about Star Story is that I want more of it. I want endgame payoff for storylines that aren't finished. I want more technology and research options because I like the crafting system. I want that rogue guy who gave me his teleport beacon and the soldier who said we'd meet again to cheer for me after the final boss fight. I want to fail even more at making friends with shrimp. All existing content feels fresh and fun, with polished presentation. I found one graphics bug that fixed itself when I saved and reloaded, along with one or two lines that the Russian-to-English translator must have missed. Thankfully, these grievances should be assuaged when EvilCoGames releases the full version. The Early Access edition of Star Story: The Horizon Escape is an encouraging pre-release. The premise and the AIs are engaging, the gameplay is smooth, and the campaign itself mixes several genres to create a multifaceted playing experience. While the length is disappointing at the time being, Star Story is what an Early Access game is supposed to be: great already, alongside the promise to get even better.